The very first clematis I planted is now affectionately known as Clematis “Something Else” as I lost the original label. I was nervous about getting clematis, I hadn’t any experience with them before and they are expensive – I didn’t want it to die. I did lots of reading in books and researching on the internet beforehand about the best way to plant clematis, how they need a sunny aspect, rich and moist, fertile soil that is well drained. I also read about how clematis should be planted deeply, in a generous and well-dug hole with plenty of organic matter. Despite learning that, the reality was somewhat different. At the time, the best place I could put my first clematis was between a rose bush and one of the well-established ornamental red-currants, in soil that I hadn’t managed to condition well because it was full of roots. Those roots also meant that I couldn’t dig a deep hole. In fact, I couldn’t even dig to the depth of the pot! This meant that I had to plant the root ball in a shallow grave on its side and I don’t think the clematis liked it. The shrubs also meant that it was in shade for a lot of time unless it was higher than three feet. 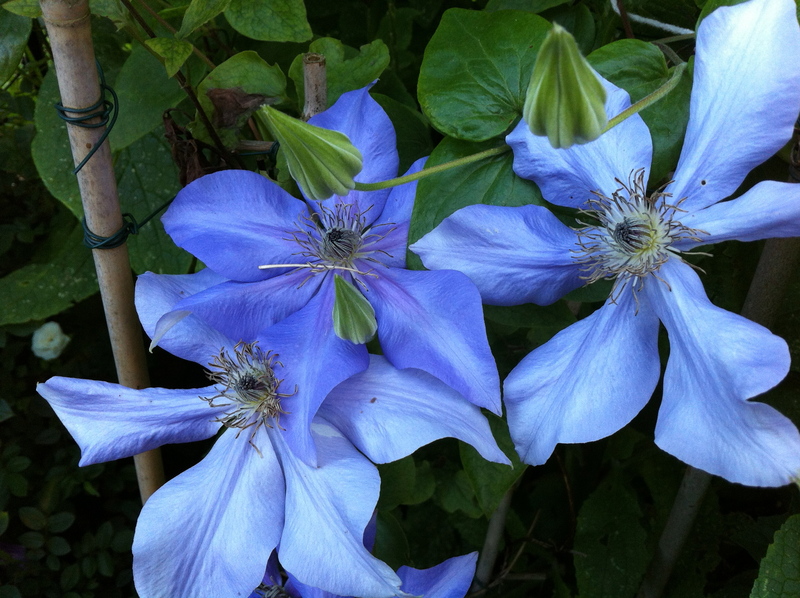 The clematis didn’t die straightaway, but the flowers on it (it went in the ground in flower) quickly dropped. The following year it grew a bit, then died back more than it grew. The year after that, it had a brave go at flowering, with one, solitary bud, but that quickly withered and dropped before it opened. This year however, it is doing quite well. There are several other buds on the vine too, all waiting to open. In all, it’s taken about three years for the clematis to get back to a similar state it was in when I first got it from the garden centre, so we’re now at square one. Hopefully the roots have figured out which was is “down” and so the only way is “up”. And is it really that lovely blue, or is it a trick of the light? Whatever it is, it’s gorgeous! I have a yellow “scrambler” for covering a fence at the back of the border – it’s either Bill MacKenzie or similar, and if you keep cutting the little yellow bells it goes on, and on, and on…. mind you as it produced a couple of thousand last year, I was kept busy. But it was worth it! Its somewhere on my blog which is not as neatly laid out as yours! All the pictures on the site are not post-processed in anyway so it’s whatever the camera sees. I took the shot in the evening when the clematis is in shade so the light blue really stands out against the dark green foliage. It is a nice variety (once it gets going) and I’m sure it’s quite a common one. I’m sure I’ll discover the name if I go hunting through clematis catalogues.